Mali Mish - Day 65: Troutstream meets Mali Mish in Ludington, Michigan. As you can tell from the photo, the campground is near full capacity. I am glad that I did not take the chance yesterday to try my luck today. Even though there were a few other sites open, there was only one that is relatively close to Doug and his family, AKA Troutstream, whom are meeting up with us today. Because of the acorns making such a ruckus, I got worried that a big enough one falling with enough force could potentially break the glass on one or both of the solar panels. I stacked the step ladder on top of the picnic table and got a look to make sure we are ok. And we are. There was one surprise that I had not expected to see which was this puck-like device that was next to the rear fantastic fan cover. It looks like an antenna of some sort and the plastic had gotten brittle and broken away from the base. Upon closer inspection, I found out that the Mali Mish came equipped with a SiriusXM antenna. Well, I knew our Airstream came loaded to the gills with options, but after 4 years of ownership, I am still finding out new things. In this case, a new things that is no longer new. Since we never had a satellite radio subscription, it is of no consequence to us that it may not be working. I just cleaned off the rust on the surface and glued it back down with some gorilla glue. 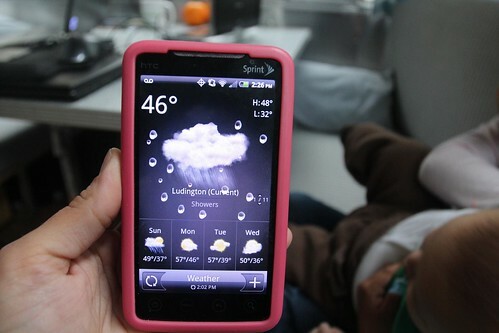 Tonight, the temperature is suppose to dip below freezing and rain is expected. I am no meteorologist but I think that means we might be seeing some snow. The girls have been very excited about meeting more kids during our visit to Ludington. The last time they played with kids was back in Sheboygan when Frank from StreamingTogether connected us with his son Steve and his great family. While we were eating the last of our leftover pizza from Gino’s East of Chicago, Doug and his family finally made it here to the campground. As weekend warriors, they are used to making long hauls to their destinations. Coming from the suburbs of Dayton, Ohio, they covered over 400 miles yesterday starting at 4pm to get to Walmart in Ludington around midnight last night. We are clearly southern California wusses. 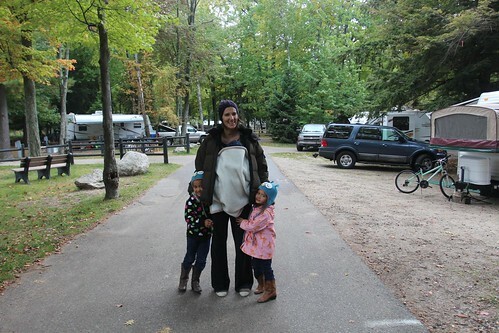 Marlene and the girls practically layered up their entire wardrobe and braved the crisp Michigan air as we walked over to their camp to hang out. 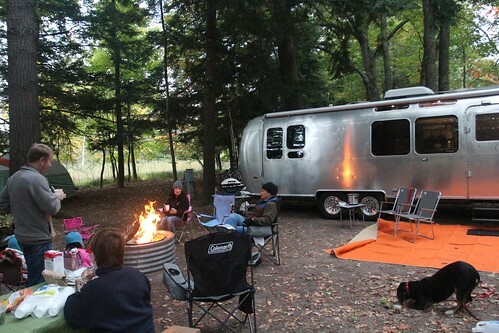 Doug and his wife Melizza have owned their 28 ft Airstream CCD since 2009. Our two families are similar in a lot of ways. 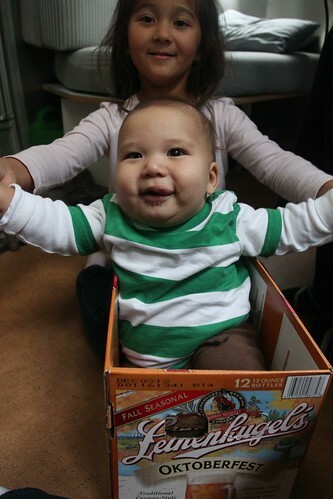 We are both multi-ethnic families with bi-racial kids. They have 3 kids, Jack, Ethan and Lucy. Like us, their youngest is of the opposite gender as the two older children. They were fortunate to find a great deal on their dream trailer for a great price new from the dealership… not too different with our experience while looking for and buying Mali Mish. 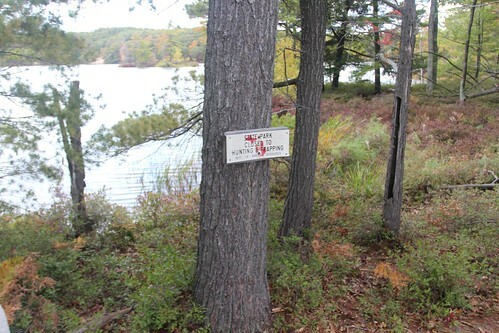 Right next to Beechwood campground is a shallow artificial lake called Hamlin Lake. 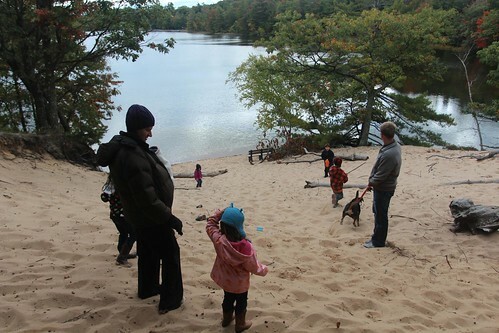 It was created with the Hamlin Lake Dam that backed up Big Sable River that feeds into Lake Michigan. 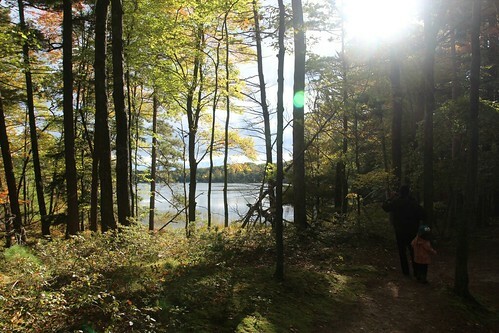 Right next to our campground, the Lost Lake Trail takes you around a loop through part of Hamlin Lake. 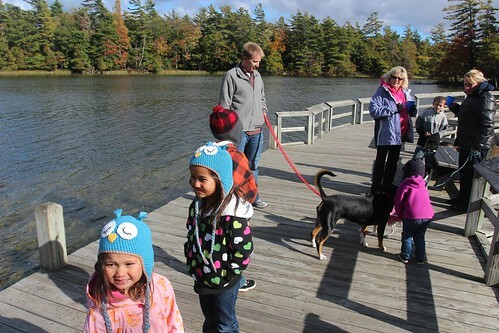 A recent renovation added a series of boardwalks that make this loop possible for campers and day-use visitors. We got a chance to get acquainted with the Trouts during our walk. 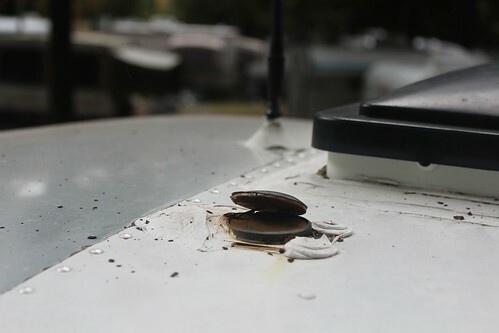 They got bit by the Airstream bug a couple of years ago like us when they realized air travel with kids does not fit into our definition of a good time. 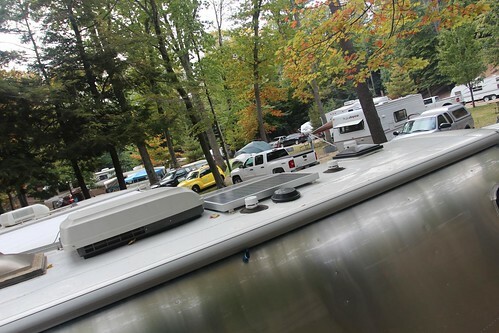 During their search for the perfect trailer, they had come across our blog and used it, along with many others, as a tool for finding out what they needed. The scenery of Ludington State Park from this 1-mile loop is stunning. We probably caught it during the best time of the year with the leaves nearing its color changing peak. In a few weeks they will all fall just before snow blankets the regions and the lake starts to freeze. Since we have been here, I have seen a couple of camo-clad bow hunters walking through the best hunting bow in the campground on their way to a hunt. I’d figure sooner than later we’d come across one carrying some dead carcass to the truck like a bear dragging a white tail to its den. Just north of the campground is prime hunting grounds for deer, wild turkey and apparently duck. 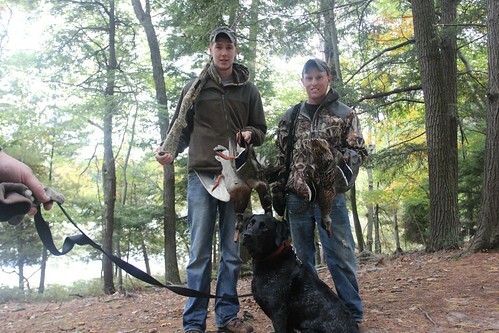 We came across these hunters and their wet dog on our walk around the lake carrying 3 ducks. I named them Daffy, Daisy and Donald but I don’t think Ava and Mila were real thrilled about it. Luckily for us, the hunting grounds are a good safe distance from the campsite. If you listen for it, faint sounds of gun fire can be heard from the campground but bird loads from a shotgun is far from lethal to us at that distance. 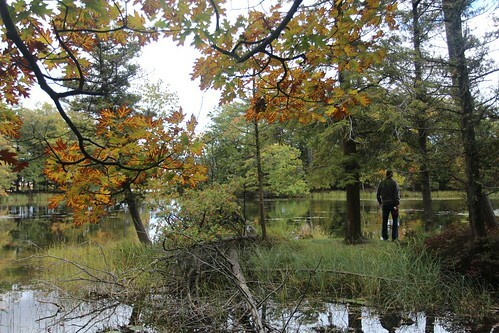 The ecology all through the western Michigan coast is very unique due to the climate, terrain and exposure to the lake. 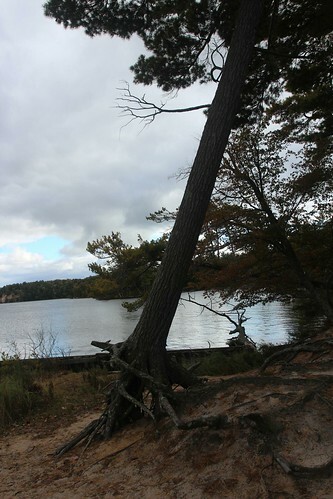 All of the trees here are grown on sand dunes next to a large freshwater lake. Because of that, the roots don’t go down real deep seeking moisture. 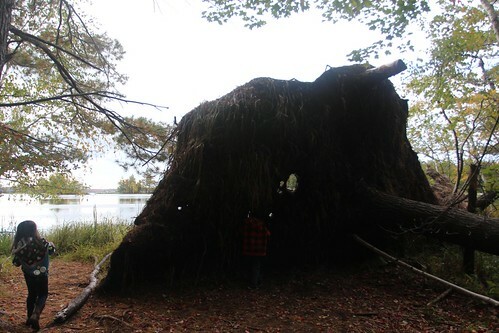 That also means as they get taller, brisk winds can easily topple them like what happened to this one. Sometimes a tree gets lucky and hangs up on the branch of the adjacent tree on its way down and continues to grow with most of its roots exposed. The Lost Lake Trail loop is roughly 1 mile long. That of course is the estimate according to Doug who is a seasoned marathon runner. The girls easily handled the hike mostly due to their excitement of having new friends to play with. Jack and Ethan are a few years older and play like boys but they thought it was entertaining. 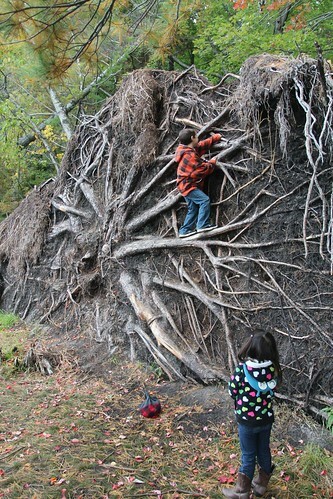 We came across this tree that had toppled with a massive root system that rose over 10 feet tall on its side. This is Ethan. He is the middle one of the Trout kids. Just like our middle child Mila, he is the crazy one. He is also obsessed with fishing, likes to break dance and practices martial arts. His older brother Jack is just the opposite. As an 11-year old, he is not interested in fishing and enjoys his studies in genetics as he represents his school in the Science Olympiad. We haven’t sat around a fire and used our camping chairs since our visit in St. Paul, Minnesota over 3 weeks ago. 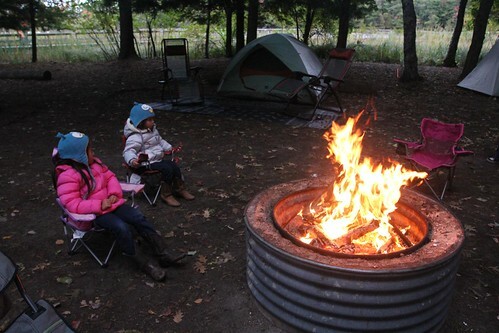 We are glad to once again pull them out of the cargo box and sit around the camp fire with new friends. Later in the afternoon, we were joined by Phil, Kim and their two daughters who are friends and neighbors of the Trouts. They regularly accompany them during weekend trips like this but they do not own an RV. They are here to do some tent camping. Yeah, you heard that right. They are sleeping in a tent this weekend as the temperature dips below freezing. Next time you hear me complaining about the insulation of our Airstream, someone please remind of of Phil, Kim and their two girls. As promised, it got cold. 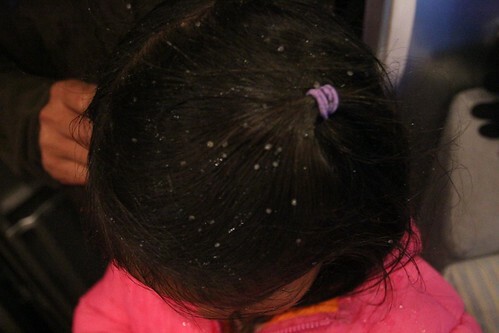 As the weather also promised, we got some precipitation and it came in the form of hail. I am going back into the Mali Mish where the thermostat is set at 70 degrees. 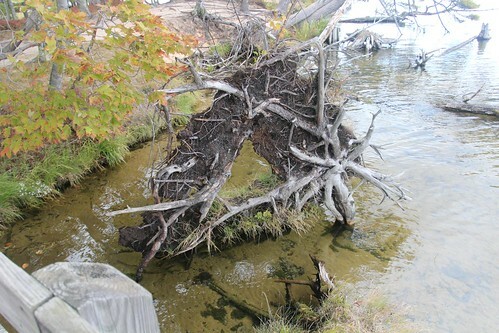 3 Responses to Day 65: Troutstream meets Mali Mish in Ludington, Michigan. Ah – love it. That walk is one of my favorites in the entire state of Michigan. We had a great time at the half asian Airstream summit. You guys were not being wusses. It was truly cold last weekend although the weather we experienced on Saturday night was not what I would consider hail. I love the duck picture and can’t help studying the girl in it. My boys descended into Lord of the Flies mode on this trip. Luckily for you, Luka will not have a big brother to fight with. The photo on the dunes appears to have been taken just before the “caning incident”. Thank god for little girls. 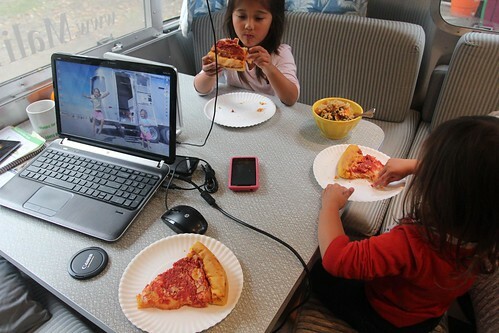 The number of Airstream bloggers travelling with kids is a small club indeed. 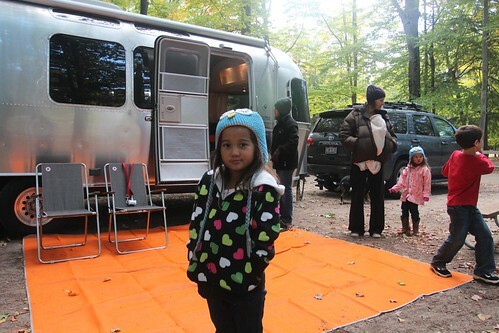 The number of Airstream bloggers travelling with half asian kids might have been fully represented by our respective families last weekend. Stay warm and we will see you in Ohio. P.S. You are supposed to allow the kids to write on the walls while eating Gino’s East. It makes me look forward to Luka as he grows bigger and more active. Mila has definitely picked up the tradition of writing on the walls (and more often on herself) in the Airstream, even when we are not eating Gino’s East.